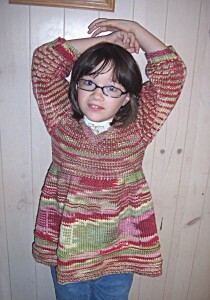 This is the “Mesosmock” pattern by Jen Sullivan. Halle picked the yarn– Loops & Threads Incredible in Summerset. It worked up pretty quickly. I think I may have to try this pattern again, in a solid color next time. Hopefully Halle can get to wear it few times before it’s too warm for sweaters.